AllMyApps is a free service for Microsoft Windows devices to install multiple selected programs in one go on the target computer system. The software installation manager AllMyApps offers similar functionality as Ninite which we reviewed last month. Both applications allow a computer user to install multiple programs without much user interaction, or to have to download the programs manually before they can be installed. But that's where the similarities end. 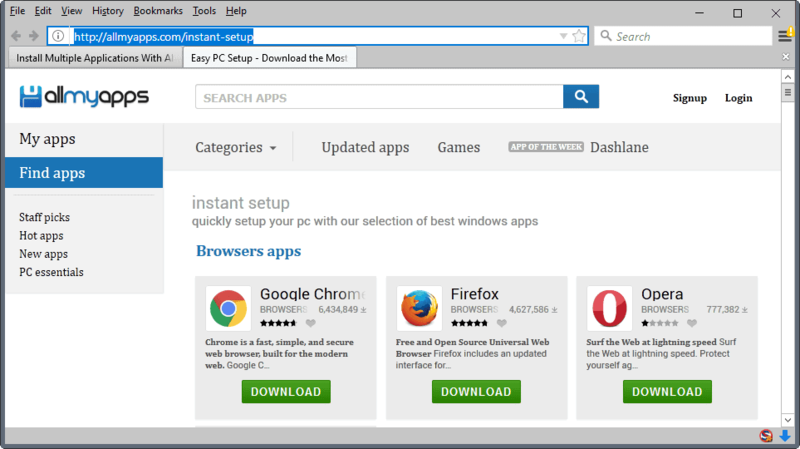 Ninite creates a custom installer based on the selection of applications that you make on the homepage of the service. Update: AllMyApps is no longer available. We suggest you try Ninite instead which we linked above. 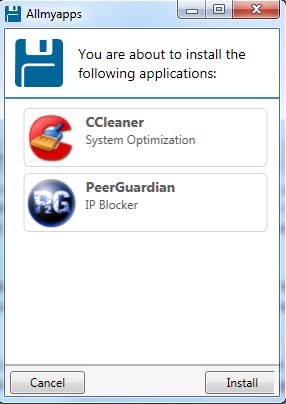 AllMyApps, on the other hand, is a software program that needs to be installed on the computer system, and an online service which the desktop program uses to populate the list of supported programs that users can install on the PC. Another difference that becomes obvious right away is the support for both Windows and Linux operating systems. Ninite only supports Windows at the time of writing. AllMyApps, on the other hand, makes the whole process more time-consuming. You need to download the application and install it on the computer system. An account on the website needs to be created as well afterward. Once that is done it comes down to selecting the applications that you want to install on the system the software was installed on. That selection takes more time compared to Ninite as the developers have listed them in categories with no apparent option to view all at once. It usually takes a few clicks to add an application to the list of applications. AllMyApps offers more applications than Ninite does. Both seem to provide access to popular applications such as CCleaner, Google Talk, Paint.net or ImgBurn to name a few. The applications need to be transferred to the local computer first. The web browser will display a launch application dialog (Firefox does at least, not tested in other web browsers) with the AllMyApps application preselected. Security software of the operating system, like UAC in Windows, may display a prompt that needs to be accepted before the data can be transferred. The program will then display the applications in its interface giving the user the option to cancel or start the installation. A click on start will initiate the download of the setups, and afterwards the installation of the selected software programs without further user interaction. Users who want to install multiple applications at once now have two programs to chose one. Ninite works only on Windows machines, and does not offer as many applications but is less complicated to use. AllMyApps is compatible with Windows and Ubuntu Linux, offers more applications to install but makes it harder to install the applications due to the registration and software selection process. Users who want to try out AllMyApps can visit the project's homepage to do so. PackZoola–does anyone use it? I find it quite handy. Ninite now has a Linux version (but only 17 programs/apps).